October will become the longest month of the year when several countries across the globe will adjust their clocks one hour backward a week from now. “Typically, clocks are adjusted forward one hour near the start of spring and are adjusted one hour backward in autumn,” say experts from the State Metrology Center which is mainly done on the last Sunday of March and on the last Sunday of October. Sandford Fleming, a Scottish-born Canadian engineer and inventor had proposed worldwide standard time zones. His gained support of the US government in 1883, and 26 countries signed the time zone agreement in Washington DC in 1884. A time zone is a region on Earth, more or less bounded by lines of longitude, that has a uniform, legally mandated standard time, usually referred to as the local time. Time zones are adjusted seasonally into standard and daylight saving(or summer) variants. Daylight saving time zones (or summer time zones) include an offset (typically +1 hour) for daylight saving time. The daylight saving time idea was put forward by US statesman Benjamin Franklin. Nowadays, 110 out of 192 countries adjust their clocks twice a year. Iceland is the only exception in Europe. However, countries located near equator never as Tajikistan, Uzbekistan, Georgia, Turkmenistan, Kyrgyzstan and Kazakhstan do not follow it. 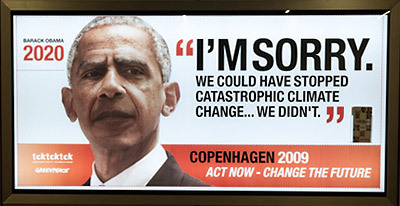 In the “Hopenhagen”– the World Climate Summit in Copenhagen, if the world leaders, U.S. President Barack Obama, German Chancellor Angela Merkel, French President Nicolas Sarkozy and British Prime Minister Gordon Brown, don’t make a sincere-to-heart commitment, their very future may look like these. For the moment, they are the GODs that can save the climate for our future generations to live, survive and thank us. Let the Almightly give them the conviction and courage to commit to save the earth. Malaysian President Mohamed Nasheed will chair the meeting on October 17 ahead of the world climate change summit in Copenhagen in December. The 14-member cabinet were taught scuba-diving basics over the weekend. The cabinet will don wet suits and scuba equipment and dive to a depth of six metres. They will then ratify a pledge calling on other nations to slash greenhouse gas emissions ahead of the Copenhagen meeting. Cabinet members will communicate using whiteboards and hand signals. The Maldivian archipelago is on the front line of climate change. A very nice and innovative gesture by the leaders of Malaysia. It goes to show that only words are not enough to tackle the climate change issue. Serious actions, which encourage the common man to act, are what is required from the world top leaders, for a global movement to save our dear planet. So all those who have access to the decision makers of the nations, please urge them to act and act fast; for the time is not far before our dear earth becomes inhabitable and the scientists have not yet come up with an alternate earth where we can migrate to. The Iraqi invasion of Kuwait in 1991 caused a lot of destruction. Most prominent of them was setting the oil wells of Kuwait on fire. Imagine the herculean task of extinguishing these oil well fires, which raged both horizontally and vertically. Here are a series of 5 videos which shows how the experts managed to do it and what they used to achieve that. Salute to the ingenuity of the master mind, who decided to use the jet engine on the water nozzle to create that impact, which burst the fire (video 3 – notice the change of water flow between 3.23 & 3.59 onwards). Finally there is some initiative from the people in Kuwait towards active participation in saving the environment. Pledging solidarity with the international campaign to combat global warming, Kuwait will observe a ‘black-out’ on March 28 to take part in the ‘Earth Hour’; a global campaign designed to help combat global warming. That hour the power supply will be temporarily cut off to the Kuwait Towers, the Liberation Tower and 26 major shopping malls across the country for an hour, starting 8:30 pm. Well, we all as residents of Kuwait need to do our bit, by doing our efforts towards making it a success. Let us then see how much energy we saved in that “one earth hour”. Three Cheers for the movement. Well something that comes to my mind is the thoughtless in having the full office tower flooded with lights from the wee hours of the evening and throughout the night, even when there is no or skeletal staff in the premises. Wonder, what logic applies here. I prefer not to take names, but a night tour of the city will certainly reveal all those ‘culprits’ (pardon my language, but they are contribtuting to the global warming and it is affecting me and many others). Maybe Tarsheed should do a survey.